Zetsche's base salary, excluding bonuses, remained unchanged at 2 million euros. FRANKFURT (Bloomberg) -- Daimler has raised CEO Dieter Zetsche's pay 1.4 percent after the maker of Mercedes-Benz cars posted record deliveries last year and narrowed its sales gap to rivals BMW and Audi. Zetsche's compensation for 2014 rose to 8.36 million euros ($9.49 million) from 8.25 million euros a year earlier, the automaker said on Tuesday in its annual report. 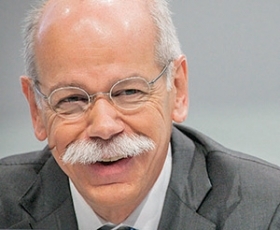 Zetsche’s base salary was unchanged at 2 million euros. Mercedes deliveries last year rose at a faster pace than brand sales at larger competitors BMW Group and Audi. Helped by demand for the flagship S-class sedan and compact cars such as the GLA crossover, Mercedes handed over 1.65 million vehicles to customers in 2014, a 13 percent increase. Still, Mercedes trailed sales at VW's Audi unit by 91,090 and was 161,709 deliveries behind BMW's namesake brand. In addition to his salary, Zetsche's remuneration comprises a short-term bonus of 1.73 million euros, a medium-term bonus of that amount payable in 2016 that depends on share performance, and long-term variable compensation including stock options. Both bonus figures were raised 1.2 percent. Combined pay, bonuses and stock options for Daimler's management board fell 5.6 percent to 28.5 million euros following the January 2014 departure of Andreas Renschler, the head of manufacturing and procurement, to run Volkswagen's truck business. Excluding Zetsche, the base salary of the other management-board executives rose an average 5 percent, the first increase since 2011. Daimler's earnings before interest and taxes, part of the basis for executives' bonuses, fell 0.6 percent in 2014 to 10.8 billion euros. The year-earlier figure was boosted by a 3.22 billion euro gain from Daimler's sale of its stake in planemaker Airbus Group. Earnings in 2014 were helped by disposals of holdings in electric carmaker Tesla Motors and a joint venture with engine producer Rolls-Royce Plc. Daimler, also the world's biggest truck manufacturer, is forecasting that vehicle sales in 2015 will exceed last year's deliveries, while revenue and earnings will climb "significantly." Chief Financial Officer Bodo Uebber earned 3.75 million euros in pay, bonuses and options for last year, a gain of 6 percent. Compensation for Wolfgang Bernhard, the head of the Daimler Trucks division, rose 11 percent to 3.35 million euros, while Hubertus Troska, whose contract as head of Daimler's Chinese division was extended through 2020 last week, received 3.22 million euros, 6.5 percent more than a year earlier.